parking & arrival - please carpool! DIO Fest is a backwoods-campout festival for 3-day attendees, requiring you to park off-site, load your gear on the shuttle, ride up to the festival grounds and then establish your campsite from there (it’s pretty mellow, we promise). Alternatively, you can buy a day-pass and simply ride the shuttle up to the festival for the day and ride back down to town at night, after the music is finished (the closest accommodations are in Boulder Creek, Ben Lomond, Felton and Santa Cruz). IF YOU'RE AS PSYCHED AS WE ARE, BUY A 3-DAY CAMPING PASS AND RIDE THE SHUTTLE ON UP. CAMPING IS FIRST COME FIRST SERVE - IN A BEAUTIFUL SETTING AMONGST THE REDWOODS AT CAMP KREM. PLEASE PACK LIGHT, AND PACK IT OUT. Parking is extremely limited and attendees park off site in Boulder Creek. Shuttles run from 10AM to 11PM from the lower lot pickup locations (see map below) up to the festival grounds. Keep your eyes peeled for the parking & shuttles signage as you head up Highway 9. They'll be plentiful and mighty prominent. Camping will be first come, first serve. Please be mindful of your neighbors and welcoming to the late arrivals! Have all of your camping gear in a backpacker fashion, ready to rock and roll up the mountain with ease. You'll be dropped off by the shuttle at the box office and will be directed to the camping areas from there. Should you want to stay offsite, there is gorgeous camping at both Big and Little Basin Campgrounds, as well as lodging at the Quality Inn & Suites in Ben Lomond. Be sure to book in advance. Carpool on HWY 9 to downtown Boulder Creek. Signs will direct you to our off-site box office at Schwarzbach Real Estate. THIS STEP INSURES THAT NON-TICKET HOLDERS WILL NOT GET ON THE SHUTTLE OR FOLLOW THE SHUTTLE TO THE FESTIVAL, IF the festival is not sold out tickets will be available for late bloomers on Friday or Saturday at the off-site box office. Offsite parking passes will unload their gear from their own cars, then be directed to their parking spot, and then load their gear onto the next available shuttle up to D.I.O. After you've gotten off the shuttle, check in at Will Call (a.k.a. Front Desk). You'll then get your wristbands. If you are camping at the festival site you will also be assisted by DIO Fest volunteers to find your camping spot and settle in! ON-SITE PARKING PASS HOLDERS MUST ALWAYS FOLLOW THE SHUTTLE UP OR DOWN THE DRIVEWAY, MAINTAINING A ONE-WAY FLOW OF TRAFFIC. The DIO Fest Shuttle is available to transport attendees from the Off-Site lots to the main festival grounds. The shuttle will pick up passengers at Off Site Lots A and B, but not the overflow lot. The Shuttle will drop you off at Will-Call, you'll check in, then get your wristband. Be sure to have your valid ID! Then you can stake a claim in the camping facilities - staff will be available to assist you load gear and choose an appropriate camp spot. To respect our Boulder Creek neighbors and community, it our responsibility to have as little of an impact on surrounding roads and neighborhoods as possible. So please, be patient and follow the lead of DIO Fest parking staff. Always follow the shuttle. When we all get to the top there’ll be high-fives and jams all around. PLEASE DO NOT WALK ON HWY 236 OR NARROW FESTIVAL DRIVEWAY. Take Graham Hill Rd. to Felton. Make a right turn onto HWY 9. Follow HWY 9 into the town of Boulder Creek. Continue on Highway 17, toward Santa Cruz, into the Santa Cruz Mountains. The road is good here but be aware that there is often heavy traffic. Look for the Mt. Hermon/Glen Canyon Road Exit and take it. Go right on Mt. Hermon Road into the town of Scott’s Valley. Follow Mt. Hermon until you reach a T-intersection at Graham Hill Road. Turn right. Turn right again two blocks down at the next signal onto Highway 9 and follow it for six miles into the town of Boulder Creek. 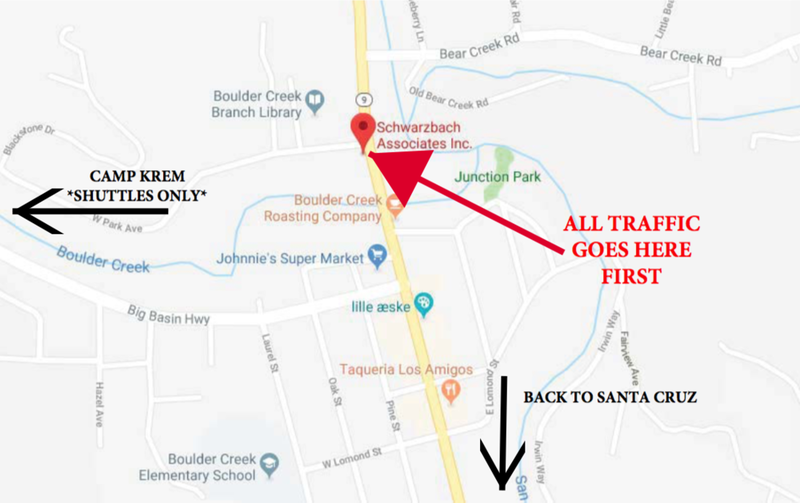 The fastest way to come from the South is actually to go to Santa Cruz first, and then follow the directions listed above from Santa Cruz to DIO Fest.